In concert, Mahesh Kale immerses the listener in a beauty that is hard to describe. 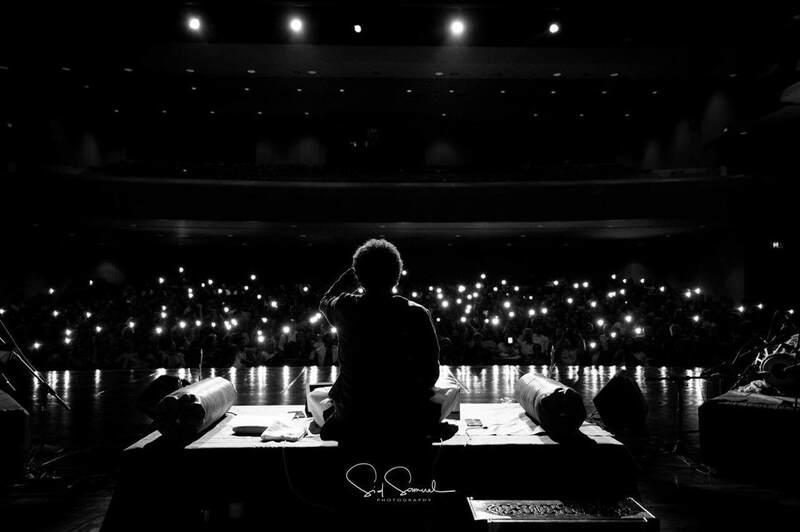 While Mahesh sings, each person is connected to every other listener and to the universe by a string of notes. Mahesh, with mastery of sound and purity of soul, weaves stories, paints pictures, and takes us on a musical journey to discover that beauty together. Those who have attended one of Mahesh Kale’s concerts know what I am talking about. And those who haven’t will discover this connection and soul-stirring feeling on September 16th, 2017. I have been a student of vocal music since I was twelve. On again and off again, I travelled through life, continually drawn to the overwhelming beauty in music, be it Gospel, South Indian Classical, jazz, or European Classical. But it was only after I heard Mahesh that I felt like I was finally home. I met him through a friend who was singing Yeri Ali in Raag Yaman. I asked her where she learned such a pretty song. The very next week, I accompanied her to music class, heard three notes come out of Mahesh and knew I wanted him as my teacher. Shortly after, I listened to Mahesh, live, for the first time in a baithak style concert at the Sangathi Center in Berkeley. I was speechless and irrefutably hooked. Through music, Mahesh takes you with him on a journey. He described what that journey is like in my recent class. “I’ll tell you what it is, you are taking [the audience] on a hike with the promise of a great view. So they already have that assurance but you blow them away by the magnitude of the view. And it’s very premeditated in the scope of things. Sometimes, I took you [on the hike] but I didn’t even know there was this view. A good tour guide hits enough spots so that the person who is taking the tour is more than satisfied but doesn’t become a puppet to the task and [the tour guide] explores and discovers beauty to show as he sees it for the first time.” In concert, Mahesh seems to constantly discover breathtaking views for the first time with the audience. Mahesh sings with an undeniable purity; the kind of purity that makes him completely transparent. Every lilting note is sung with care and love, straight from his heart to ours. In fact, Mahesh says that the best music is when the beauty is in their hearts but you bring it out of them. Mahesh is soulful; indeed, his soul is full of love. He jokes, pranks, gives us food analogies, and stern remarks in music class, but when he ascends the stage, his soul takes over. He is no longer just a singer but a messenger of peace, love, and universal energy through sound. That energy is transmitted with the purest intention through his musical presentation that he shares with everyone. In concert, he uses all the same tools a classical artist is trained to use but he seems to be reaching for something intangible, beyond sound, and soul-stirringly beautiful. Music is his vehicle for getting there, for sending that message to every person who hears him. So join me in an evening filled with the beautiful sound of Mahesh Kale and paint your own pictures - think, reflect, and discover the beauty for yourself. Let the music sink in deep and come away uplifted and light. The only way to describe the experience is complete transcendence. Join us for a multi-media introduction to Kirtan, a devotional song and storytelling tradition from Maharashtra state in Western India. Mahesh Kale, an accomplished North Indian classical vocalist, will perform dazzling renditions of kirtan songs, and Prof. Anna Schultz will narrate histories that bring the contexts of kirtan to life. Group discounts available for groups of 8 or more. For more info or group tickets, please email us at tickets@icmafoundation.org or call (408) 508 ICMA.